The American sycamore is a grand, picturesque tree if well placed in the landscape. 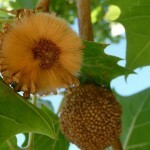 This large deciduous tree is naturally distributed across the eastern half of North America, from Maine to Florida, so it is beneficial to grow from local stock. 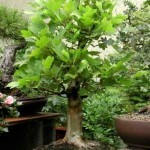 It is a lowland tree that’s adapted to soils that become flooded intermittently throughout the season. Happy trees can survive for hundreds of years. Sycamores are best known for their beautiful bark and elegantly irregular branching patterns. 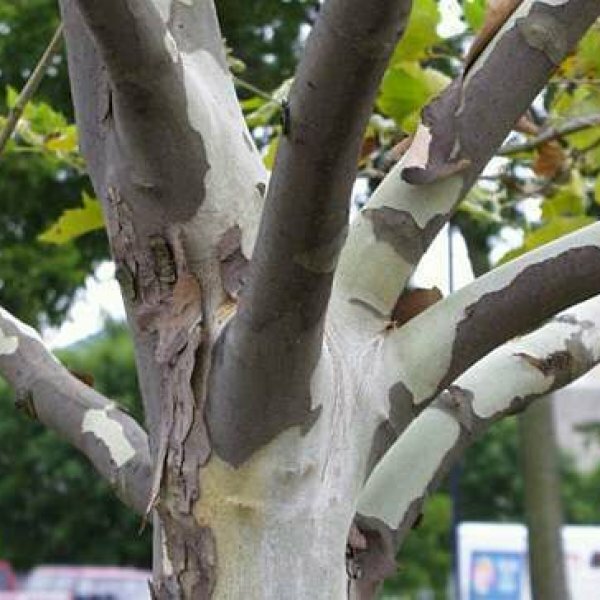 The multicolored flaking bark is in overlapping shades of brown, gray, creamy beige, and white. The younger branches tend to have more white and the twigs are orange-brown with a zigzagged appearance. The broad, open limbs of mature specimens can almost look contorted and the trunks become thick and protruding in very old specimens. 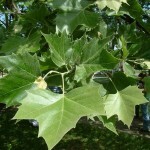 Sycamore leaves are almost maple-like but appear broader, larger and have sharper, more acute tips. They are bright green when they emerge in spring, deepen to dark green by summer and turn golden tan in fall. Each has three to five-lobes. The flower clusters appear in spring when the leaves emerge. The inconspicuous blooms are male or female, reddish and appear in clusters across the branches. The golf ball-sized fruits that follow turn from green to light brown and decorate the branches into winter until they finally fall and shatter into fluffy filaments. 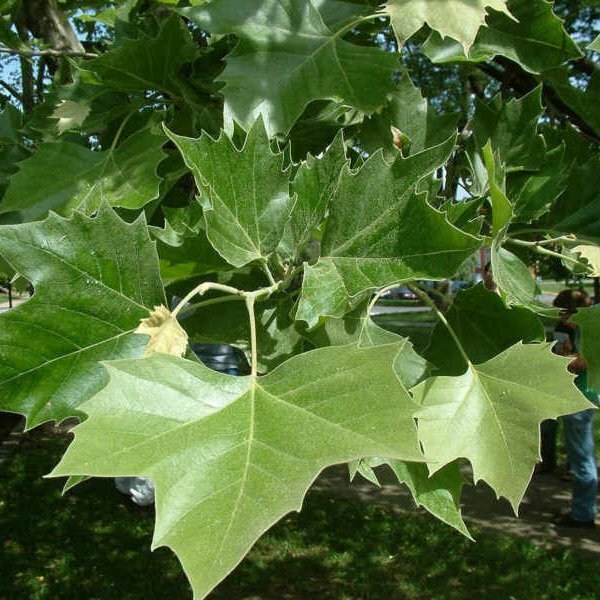 Plant American sycamore in full sun and sites with moist, fertile soil. It does demonstrate considerable tolerance for drier and the more shallow soils associated with residential suburbs, as well as seaside gardens. 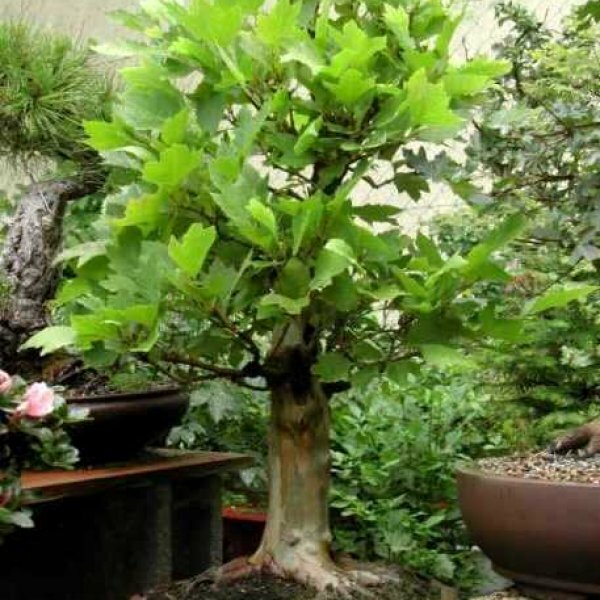 This tree develops substantial surface roots so it should not be planted too closely to buildings or sidewalks, which will buckle under pressure. Another caveat to planting sycamore is its susceptibility to anthracnose. Infected trees show their symptoms in varying degrees. Usually, they leave out late, their leaves are blotched and badly infected trees tend to drop their leaves early—sometimes in early summer.